One of the major aspects of facial aging is volume loss, and much of that is due to the gradual diminishment of fat (medically known as buccal fat, but commonly referred to as “baby fat”). It leads many people to conclude that lost fat in the facial area, that once gave a youthful appearance, should be replaced by fat from other parts of the body, such as the thigh or abdomen. However, the fat transfer/fat graft procedure is not that simple or straightforward. Since fat is a physical volume that needs a blood supply (unlike hyaluronic acid synthetic fillers), it is unpredictable if that volume will take the way the doctor wants it to. Fat transfers should only be done where the skin is thick, such as the lower face, and not where skin is very thin, like the lower eyelid area. 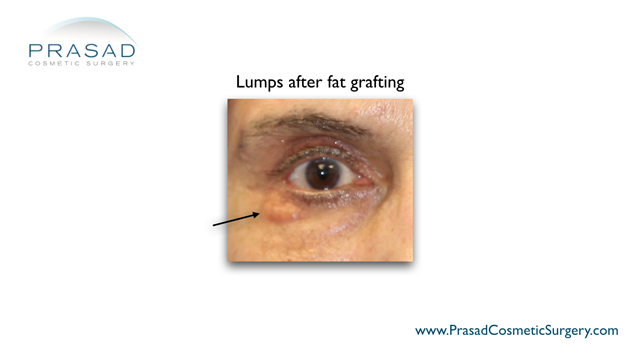 Fat grafting under thin eyelid skin can show the lumpy, inconsistent shape and texture of fat. Revising effects of fat transfer under the eyes requires extensive surgery. Fat transfers can be done successfully around the mouth and lower cheek area where the skin is thicker. We use this regularly to treat the deep folds around the lower mouth area called mesolabial folds, or commonly referred to as “marionette lines”. Lines that form at the corners of the mouth can also be treated with fat grafts in the same treatment session. The corners of the mouth are called nasolabial folds, and are commonly referred to as “parentheses lines”. This area can also be treated with hyaluronic acid fillers like Restylane and Juvederm to produce similar results. Treating volume loss with hyaluronic acid fillers is more economical since there are no extraction or purification processes needed. Hyaluronic acid fillers also have more predictable results, and are easier to remove using a dissolution enzyme called hyaluronidase if too much is applied . Volume loss due to facial aging can affect the sub brow area, leaving a hollow appearance above the eye. Fat transfers can be made to the area near the eye socket as the skin here is thicker, as opposed to the nearby upper and lower eyelids where skin is the thinnest. Dr. Prasad does not advise fat transfers in these areas where the skin is too thin. 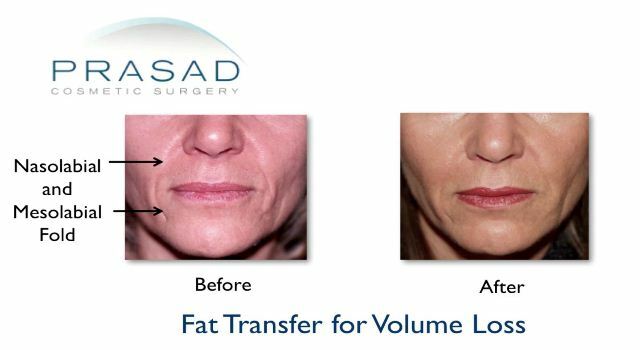 Fat transferred to augment volume lost from facial aging. Fat is transferred to the thick skin of the sub-brow area, not to thin upper eyelid skin. Hyaluronic acid fillers can also be applied in place of a fat transfer in these areas. Hands are prone to volume loss due to aging as they are constantly exposed to environmental elements that accelerate aging, such as sun exposure and loss of moisture. The thick skin of the hands make it an ideal place for fat grafting to give them a more youthful, plumper appearance. Added volume from a fat graft also smoothes out the appearance of lines and wrinkles on the hands that that become more pronounced when fat diminishes. Fat grafted to hands to add youthful volume lost from skin aging. 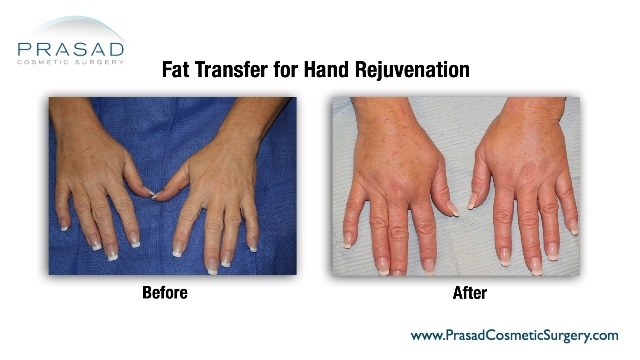 Fat transfers to the hands are often complemented by platelet-rich plasma (PRP) injection treatment to improve the skin quality and further enhance volume. Fat transfers are essentially grafts of fat taken from parts of the body that commonly have excess fat, such as the thigh or abdomen. The grafted fat is purified before transfer so anything that can cause infection or adverse reactions are removed. However, the purification process does not eliminate complications entirely. When fat is grafted, it is taken from its natural blood supply. When it is transferred, it is introduced to a new blood supply and may not always take. Since fat doesn’t always take to the new blood supply, it may still scar, become irregular, or even lumpy, which can be seen through surface of the skin, especially when some doctors do fat grafts on very thin eyelid skin. This is why Dr. Prasad does not perform fat transfers in the eyelid area. Since transferred fat needs blood supply to be viable, between 30-70% of fat grafts can be absorbed by the body. This is the reason that Dr. Prasad advises all his patients who want fat transfers to be prepared for at least two procedures, as further procedures are needed to replace fat that is variably absorbed.